I love cilantro, and was so pleased to get two big bunches of it last week. I have lots of great cilantro recipes, but I wanted to try something new this week that would incorporate the lettuce from the CSA also. Most of my cilantro recipes are hot dishes, so this cool salad is a nice change of pace. It makes a nice side or can work as a vegetarian entree. Keep your cilantro in a glass of water in the refrigerator to make it last longer. 1. Toss the chickpeas and leeks with the chili powder, cumin, garlic, oil, lime juice and salt and pepper. Warm on the stove over low-medium heat for about 10 minutes to soften the onions and beans and meld flavors. Be sure not to overcook them or dry them out. 2. When finished, toss the bean mixture with the lettuce, cilantro and tomatoes in a bowl. Enjoy! I confess I’ve struggled to find ways to eat the turnips we’ve been getting lately. We chop them up for salads or on a veggie platter, but mostly I just push them aside. This week I decided to get to know a bit more about turnips. 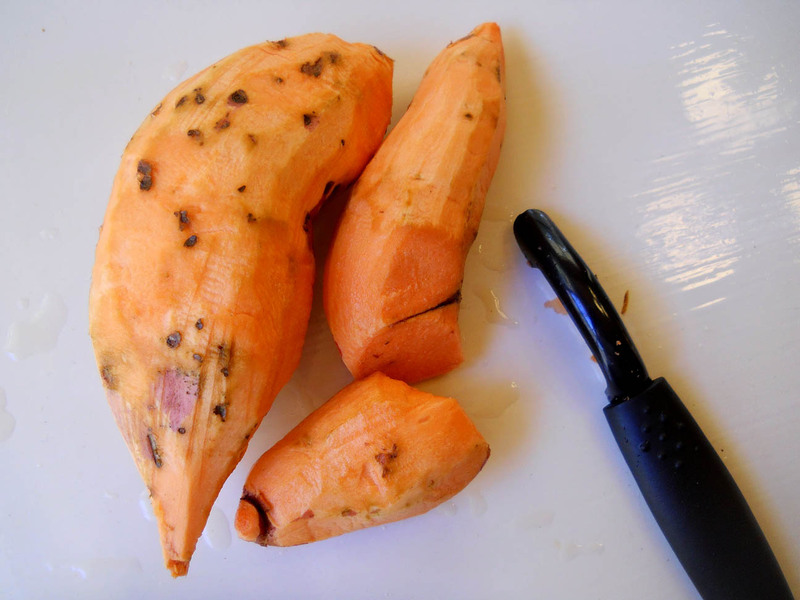 And, as usual, I was surprised to learn lots of good things about these little root vegetables. First I learned that turnips can be peeled and diced and thrown into a lot of recipes, and this seems to be especially popular with beef based dishes like Emeril’s beef stew. The turnips absorb the flavors of the foods they are cooked with, and so they compliment many soup or stir fry recipes rather well. This was really helpful for me because I had been looking for recipes that featured turnips, but now I realize they’re more like the old reliable carrot. This takes some of the pressure off the poor turnip and has helped it find a place on our table. I did put together one simple recipe where the turnip takes center stage after finding several turnip and apple recipes. This dish is half dinner, half dessert – or maybe that’s the definition of breakfast? 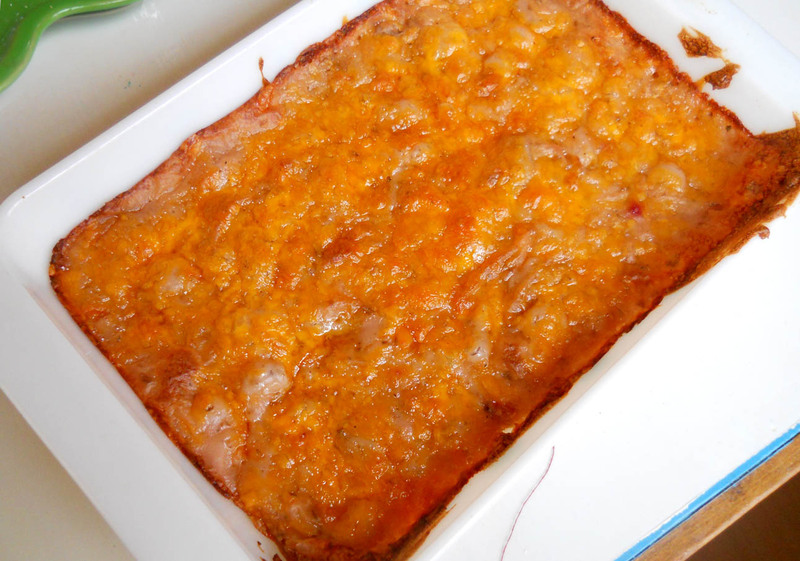 Either way, its sweet and savory, and quick to toss together. Preheat the oven to 350. Peel and dice the turnips and apples. Stir them together in a baking dish with the butter, sugar, salt and cinammon. The proportions of these ingredients can surely varied depending on your taste and what you have on hand. Roll out your pie crust and place it on top. Cover the crust loosely with foil so it won’t brown too much. Bake the Pot Pie for 1 hour, uncovering the crust for the last 15 minutes. Serve warm, but it also reheats nicely. Below are a couple of links with good turnip recipes. We’d love to hear what you’re doing with your turnips. Let us know in the comments below! This was my first encounter with Broccoli Rabe (thanks, Rose Creek Farms! ), so I did a little research first. Broccoli Rabe is a killer super food, with tender stems and leaves rich in vitamins A, C, and K and loaded with potassium, calcium and iron. On top of that, this simple recipe is quick and easy and can be served in a variety of ways, so you’ll be sure to find a place for it on your table. 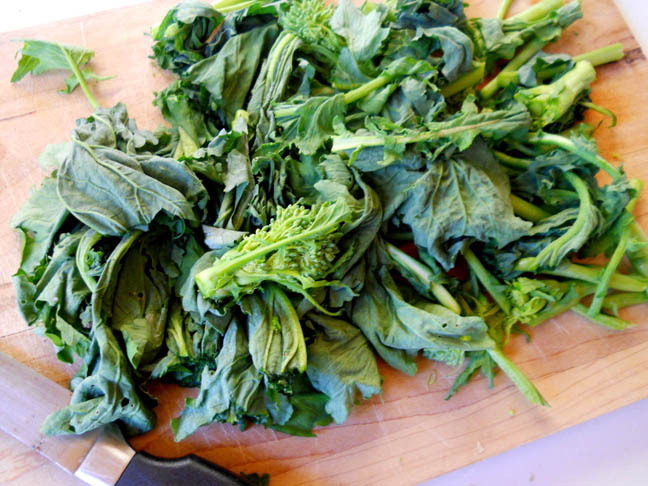 Below you’ll find instructions for lightly season sauteed broccoli rabe. You can serve it over pasta with oil and parmesan, put it on top of a pizza, or on a sandwich with a bit of ricotta cheese. You can even stir it into your scrambled eggs for a power breakfast. It makes a very pretty green for your Thanksgiving table as well, and you can serve it right on top of your roast turkey. 1.Put oil, onion, garlic and crushed red pepper in a pan. 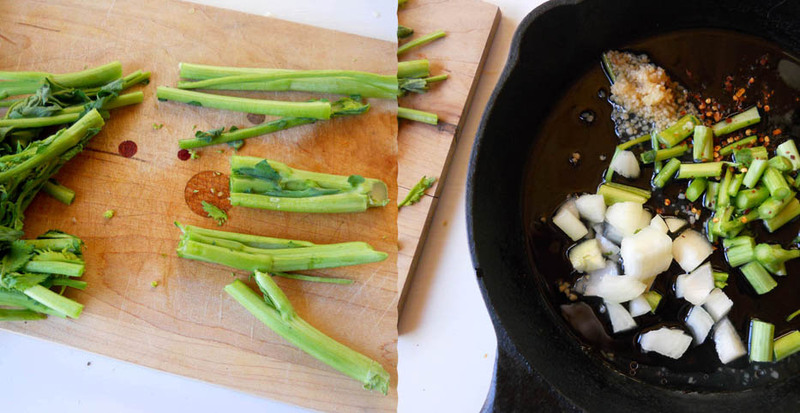 Add the thick stems from the broccoli rabe. You can discard these if you prefer, or you can add them to the pan first and saute them with the onion to soften them. Cook over medium heat for about 10 minutes or until onions and stems are tender. 2. Meanwhile wash the broccoli rabe leaves and pat dry. Chop into smaller pieces. Next time I will chop mine a bit smaller than I did in this picture. 3. 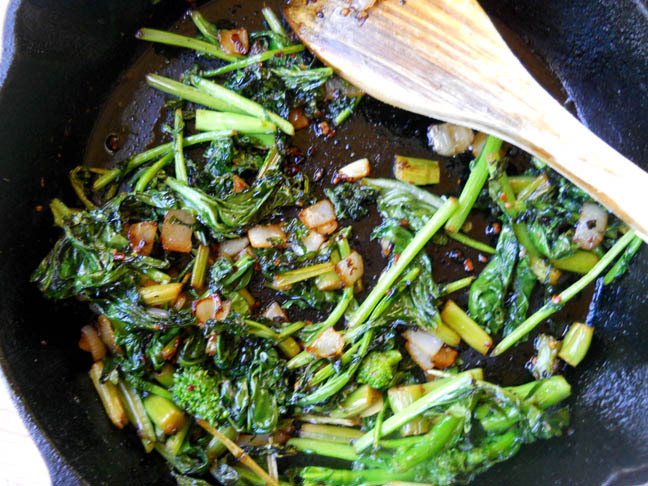 Add the broccoli rabe to the pan, and toss to coat the leaves in oil. Continue cooking until the leaves are wilted, or about 15 minutes. Season with salt. 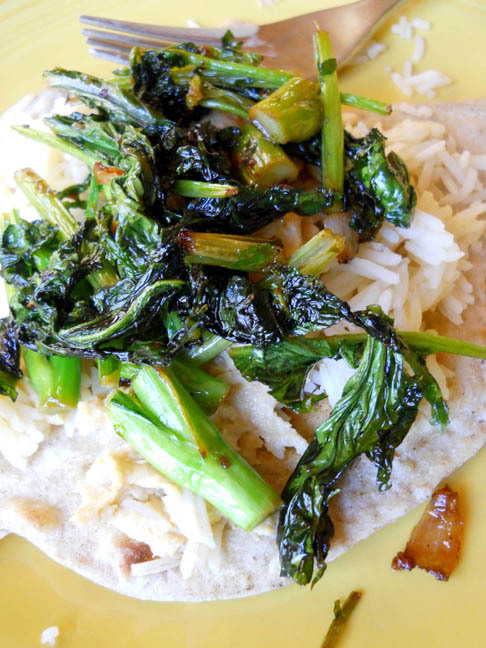 When put our broccoli rabe on flat bread with rice and hummus, which was amazing. I’m planning to prepare the Rabe like this again for Thanksgiving to serve with our turkey. I love that participating in the CSA means that I have to learn about and try new foods – even foods from outer space! Well, maybe not outer space, but kohlrabi was pretty far off my radar before this week. 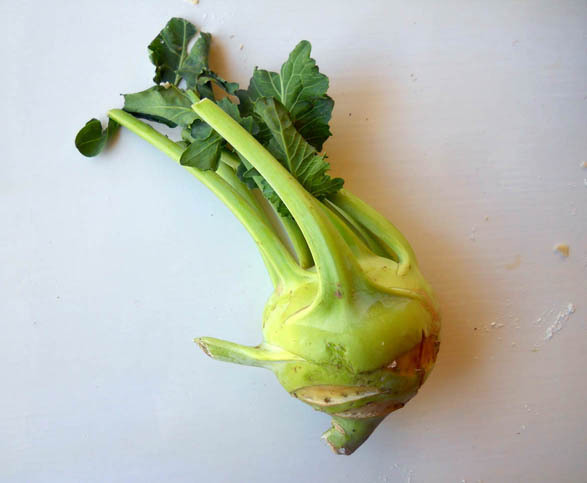 After a bit of reading and tasting this week, I’m over the moon for kohlrabi. When I picked up my box this week, Ray showed me the kohlrabi and said its great sliced raw in a salad, so I was eager to try it raw. It does indeed have an amazing crispy texture, and a sweet broccoli-like flavor. I could have eaten the whole thing raw. You may have seen Ashley’s recipe for Kohlrabi and Bacon in the last newsletter – that sounds like a win-win to me, and will definitely be my next Kohlrabi dish. 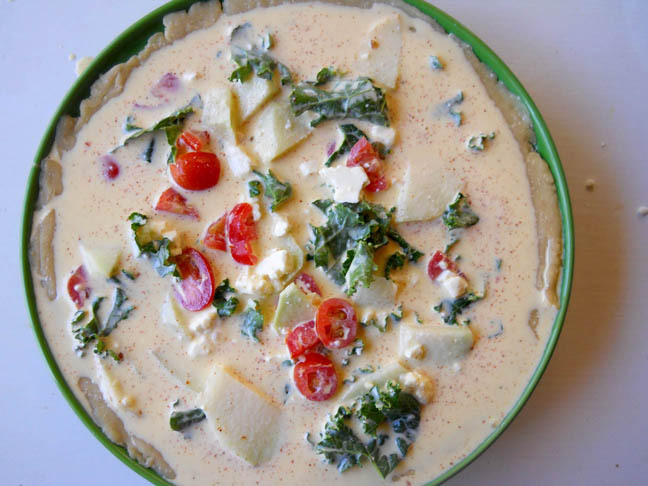 It turns out, as a general rule, you can substitute kohlrabi in any potato recipe. So you could try Kohlrabi Fries or Turnips and Kohlrabi Au Gratin. Unlike the potato however, kohlrabi is low in calories and high in vitamins C. I’m not sure how it could get much better. I baked mine into a quiche with other veggies and some feta cheese, which makes such a simple but festive comfort meal. 2. Prepare the pie crust. You can make a crust quickly or use a store bought crust. [My crust is made with 1 cup flour and a 1/4 cup butter or margarine. Cut the butter into pea size pieces with a pastry cutter or by criss crossing knives in the bowl. Add 1 tsp salt and 4-5 TBSPs cold water and stir until moistened. Pat the dough into a ball, flatten and roll out. Press the crust in the pie plate.] Put the pie crust in the refrigerator while you prepare the filling. 3. Beat eggs, then beat in cream and feta cheese. 4. 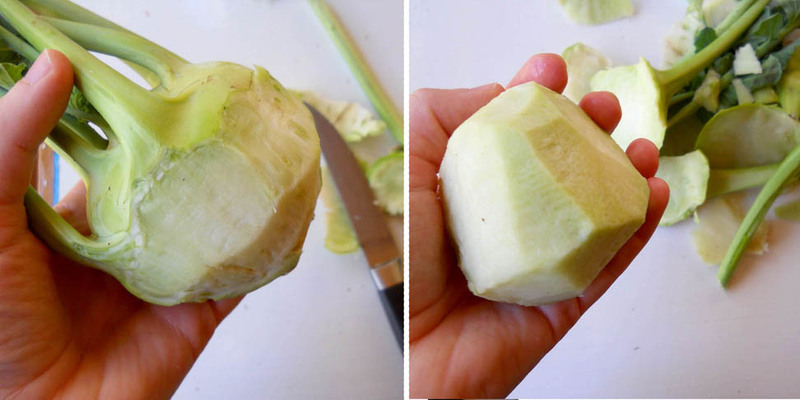 Peel the kohlrabi to get to the white flesh under the skin. 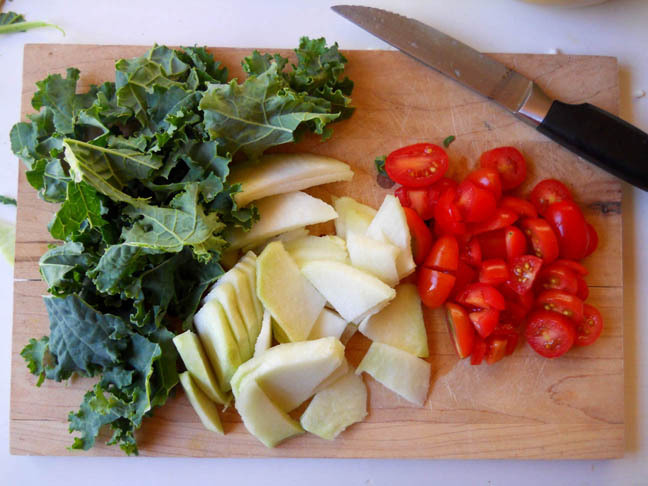 Then cut it into quarters and slice thinly.Tear up the kale and slice the tomatoes. You could use red russian kale, spinach, or broccoli rabe in place of the kale. I always like a little tomatoes in a quiche for the color, but you can substitute other vegetables if you like, or decrease the veggies and add a little sausage. 5. 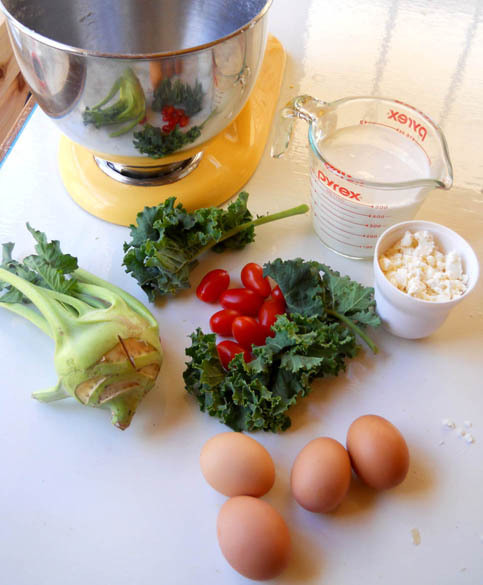 Add vegetables to egg mixture, and season with salt and paprika. Stir until evenly distributed and pour the mixture into the pie crust. Mine is a little too full, probably because I used too many vegetables, but that’s okay. 6. Bake for 30 minutes, or until a knife inserted in the center comes out clean. Allow to sit for 10 minutes before slicing. 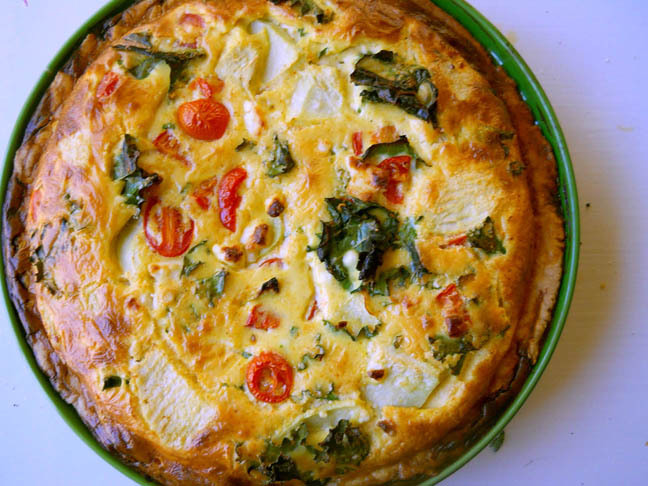 Quiches are excellent make ahead meals! To reheat later, cover the top with foil and put in a hot (350 degree) oven for 20 minutes. Remove the foil, and warm for 5 more minutes or until heated through. Ours will be dinner the night before Thanksgiving so we don’t have to dirty any more dishes! These veggies, with a hint of nutmeg and warm cheese, make an excellent Thanksgiving recipe. 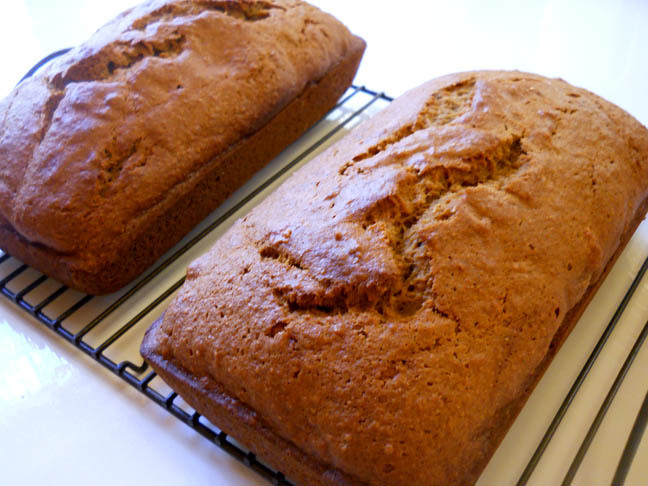 You can easily double (or triple) the recipe if you’re feeding a big family. Plus, it can be prepared ahead of time and warmed up on the big day. What more could you want from a Thanksgiving side dish? Fresh, local turnips, of course! Wash the potatoes and turnips, and peel if desired. I left the skins on. Chop the tip and the tops off of the turnip, and remove any eyes from the potatoes. Cut the vegetables into quarters. Put the vegetables in a pot, and cover them with water. Bring the water to a boil, and boil for 10 minutes, or until the vegetables are tender. Drain the water. I used a small 4-cup food processor to blend the remaining ingredients. If you don’t have a food processor you can mash them, but it will be lumpier. Puree the turnips and potatoes in a food processer until smooth. Add 1/4 cup cheese and a pinch of nutmeg and blend again. 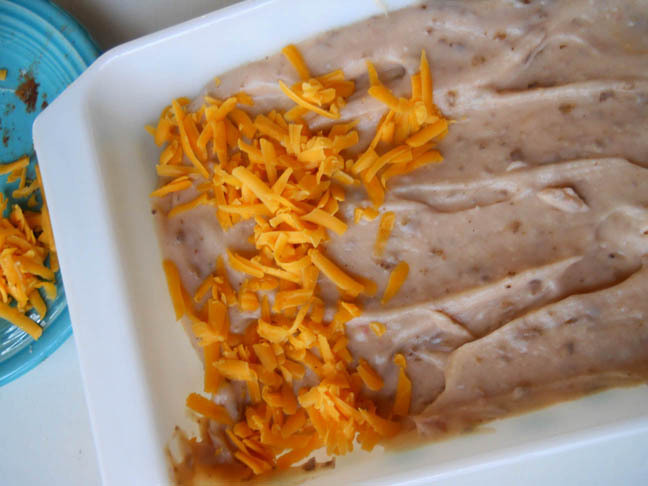 Spread the mixture into a casserole dish and top with the remaining cheese. If you’re preparing this dish ahead of time, you can put it in the refrigerator now, and resume when you’re ready to eat. Bake in a 425 degree oven until the top is golden and crispy, about 25 minutes. I hope you’re eating lots of salads and fresh veggies this week with all the beautiful greens from the CSA box. I always love a taste-test, and so we’ve especially enjoyed tasting all the different types of greens to note their different flavors. I was surprised how much flavor lettuce can have! I’ll admit our carrots have never made it to the refrigerator – our kids ate them all on Saturday night. Salads get extra points for being both healthy and easy to prepare. Eating uncooked vegetables are one of the healthiest ways to eat your vegetables because it preserves the vitamins, minerals, and phytochemicals that are often lost in food processing and cooking. And did you know that dark vegetables contain almost all of your vitamins and minerals? So you can feel really good about eating those dark greens and rich carrots. All those vitamins and minerals will help you heal more quickly, build strong bones and can lower cholesterol. 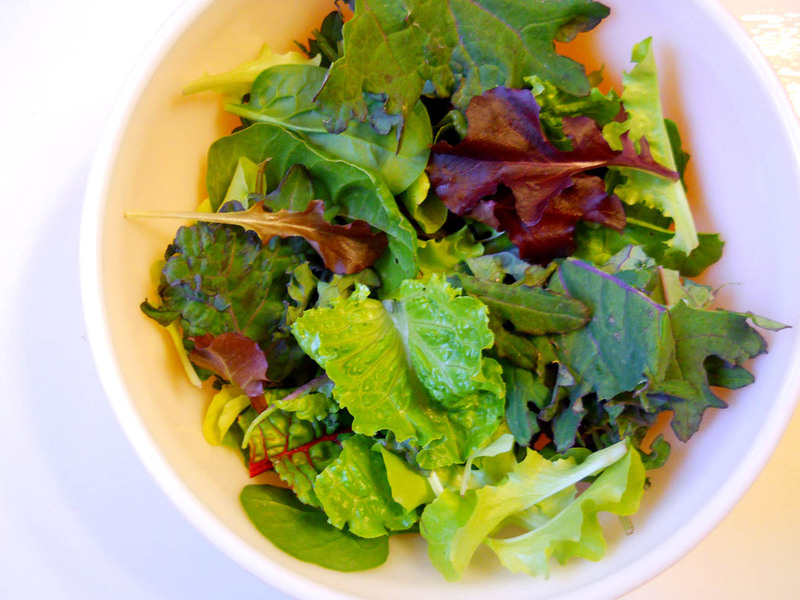 To keep up with all these greens you can add a quick side salad to every meal, or make a big salad as your main dish. Just wash, chop and toss. 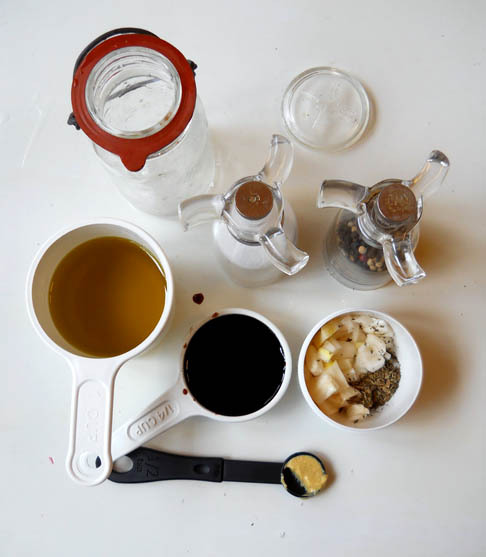 Below is a recipe for a homemade vinaigrette, and a list ideas of salad toppings you might want to keep around to jazz up your salad . Many of these can be bought inexpensively and have a long shelf life, making them a great supplement to your CSA. 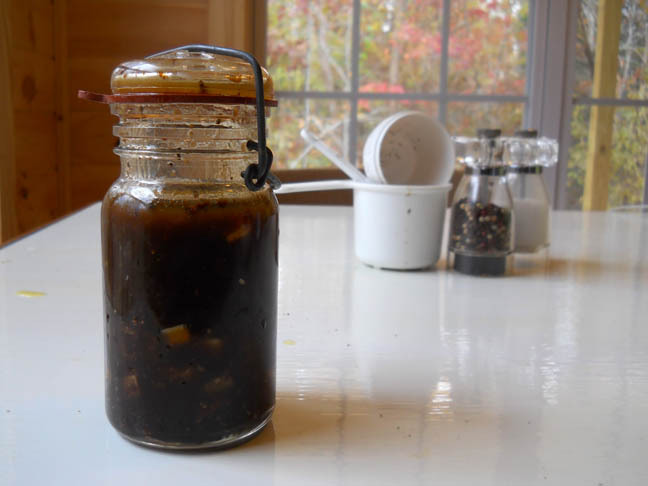 This is a good base recipe for vinaigrette. Keep the oil and vinegar ratio the same, but otherwise feel free to vary it, trying different vinegars or herbs. This would be great for the fresh basil from the CSA if you still have some (alas, I used all mine in pesto). The small amount of Dijon mustard acts as an emulsifier to keep the oil and vinegar from separating. Just put all the ingredients in a glass jar and shake. Allow 30 minutes for the flavors to blend, and you’re ready to toss some in your salad. 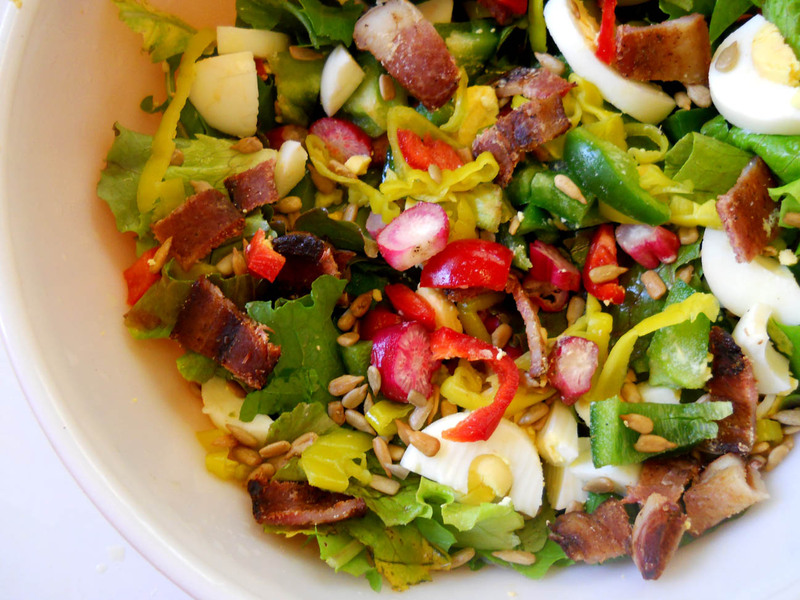 Tell us how you fix your salads! What special toppings do you use? What’s your favorite dressing? 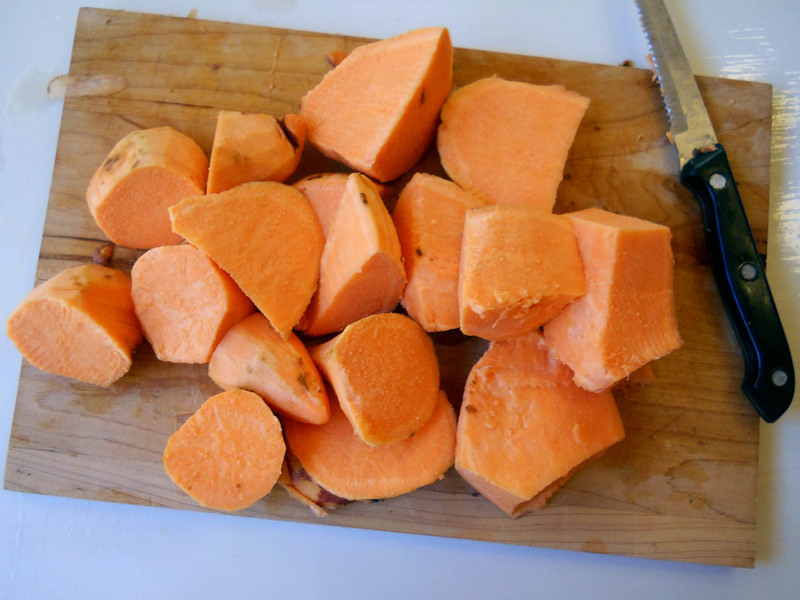 These two simple sweet potato recipes are family friendly, and will help you keep up with your weekly sweet potatoes. Even better, you can make them at the same time! 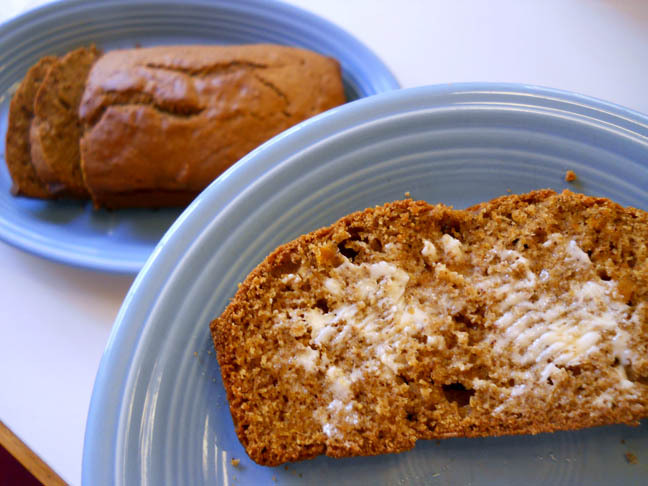 The mashed potatoes make a great side for any fall dinner, and the bread makes a sweet treat the kids will love.You can eat the bread fresh, or you can freeze it for up to 3 months so you can enjoy your fall CSA well into winter. If you’re only making one recipe, use 2-3 potatoes, but if you’re making both recipes use 4-5 potatoes – about half will go to each recipe. So let’s get started. 1. Wash and peel potatoes. Peeling is optional if you don’t mind skins in your mashed potatoes, but its a good idea if you’re making bread (or if you’ve got picky kids). 2. 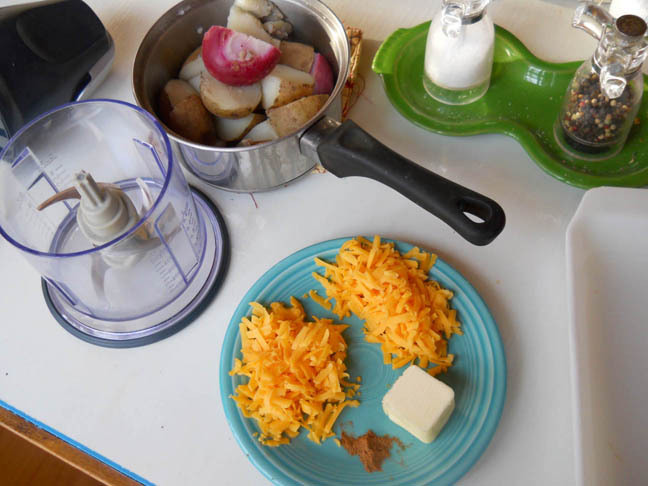 Cut the potatoes into smaller chunks, about 2 inches. Put in a pot and cover with water. Bring the water to a boil, then reduce heat and simmer for 15 minutes or until potatoes are tender. 3. Drain water and mash the potatoes. 4. Add 2 TBSPs butter, 1/2 tsp salt and stir. You can add a 1/4 cup of milk if you want them creamier. 5. Put mashed potatoes in a casserole dish and dot with butter. Bake at 350 for 30 minutes or until top is browned. Makes a nice crispy outside with warm inside. Prepare the mashed potatoes as in recipe above, ending on step 3 – before adding any ingredients. Preheat the oven to 350 degrees. Grease two loaf pans (either 8 inch or 9 inch). Mix the first 5 ingredients with a mixer. Then stir in the remaining dry ingredients. Pour the batter into the loaf pans. Bake for 50 minutes for 8 inch pans, or 1 hour and 15 minutes for 9 inch pans, or until a knife inserted in the center comes out clean. The bread continues to bake a little after you take it out of the oven, so be sure to let it cool completely before slicing. We love to serve it warm with a little butter. Store in the refrigerator for 10 days, or in the freezer for up to 3 months.